This is a simple painting I usually have my watercolor students do in their second or third class. It gives them experience with most of the different edge effects you can create with watercolor paint and a round brush. As it is painted on a very small sheet there are less problems with areas drying too fast. Watercolor techniques taught through this watercolor painting: wet on wet, wet on dry and dry brush. Subjects include: painting figures, rocks, seagulls, and beach scenes. Atmospheric perspective principles applied to landscape paintings with watercolor are discussed as well. Drawing techniques taught through this watercolor painting: drawing perspective, how to draw figures. Reference photograph: No used for this exercise, painted purely from imagination and memory. You can use one of your own reference photographs if you have one as long as it is not too dissimilar to this watercolour painting. This is a relatively simple drawing however there are some items you need to get right when drawing a beach scene like this. Firstly it is a relatively flat beach and the drawing is being done from the perspective of a person on the beach. Now draw the horizon line. The horizon line is critical in landscape drawings such as this as it determines how much sky you are going to show versus how much sea and beach. In this case, as I want to cover how to paint simple cloud shapes, something for which watercolor is eminently suitable, I have my horizon line well below the center of the sheet. The distant hill is drawn next. Make is come out of the water a little bellow the horizon line. After this draw the closest hill and it comes out of the water even lower than the distant hill. This is important as when objects move further away from the foreground their base appears to rise closer towards the horizon or eye level. I next draw the two people. I draw them so their heads are approximately at the same level as the horizon. If you draw their heads below the horizon they will appear either very short (like drawing children) or that maybe you are trying to draw them from a viewpoint above them. If I have two figures I usually make one a little smaller than the other as it makes for a more interesting design. I only draw their heads, shirts and shorts at this stage. When drawing figures it is very important not the make their heads too big or they will not look right. In fact you can get away with drawing them smaller than they are but not bigger. 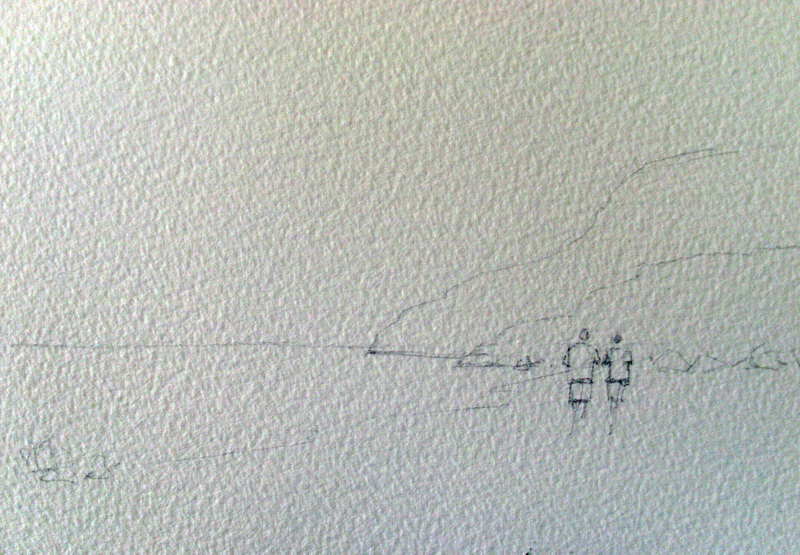 After the figures are in place I draw in some rocks on the bottom of the closest hill and then lightly indicate the waterline for this beach scene. I indicate the position of a group of rocks on the left hand side of the painting which will balance the objects on the right hand side. Make the sliver of water narrow, otherwise it can look like the water in your painting is trying to flow up hill. I will expand on these issues of drawing beach scenes in future articles and demonstrations. We can now start the watercolor painting stage of our simple painting.